Meconium is the first substance discharged from the gastrointestinal tract in the perinatal period and consists of a mixture of water (75-95%), mucopolysaccharides (80% dry weight), gastrointestinal secretions (bile salts and pancreatic and liver enzymes), solids (vernix caseosa, lanugo, and squamous cells), blood, minerals, and lipids (free fatty acids). Meconium is rarely found in the amniotic fluid before 34 weeks' gestation, probably because its passage likely requires neural stimulation of a mature gastrointestinal tract; thus, meconium aspiration syndrome, in which the newborn aspirates the meconium-containing amniotic fluid, chiefly affects infants at term and post-term. Meconium aspiration syndrome involves aspiration of meconium through the trachea into the bronchial tree, sometimes down to the alveoli. Three classes of alveoli are described: (1) those not ventilated due to complete proximal obstruction (atelectatic), (2) those with partial meconium obstruction, and (3) those with no proximal obstruction. Alveoli with partial meconium obstruction are thought to trap air because of a ball-valve mechanism by which gas reaches the alveoli on inflation but is trapped secondary to reduced airway diameter during expiration. It is challenging to oxygenate babies with meconium aspiration syndrome, because the alveoli where gas trapping occurs may rupture, leading to air leak. Also, meconium in the alveoli may deactivate surfactant. In addition to obstruction of the airway, the aspiration leads to an inflammatory response in the lung parenchyma (chemical pneumonitis). It is this inflammation, not the meconium itself, that results in the patchy infiltrates seen on chest radiography (see the images below). It is not clear which component(s) of meconium triggers the inflammatory response. However, bile and liver enzymes have been suggested as the causative agents. The viscosity of the meconium and the response to aspiration are highly variable, and pulmonary hypertension is a significant comorbidity that is not obvious on chest radiography. Therefore, the clinical picture may be poorly correlated with the radiographic findings. Meconium aspiration. Serial radiographs in a newborn with uncomplicated meconium aspiration. 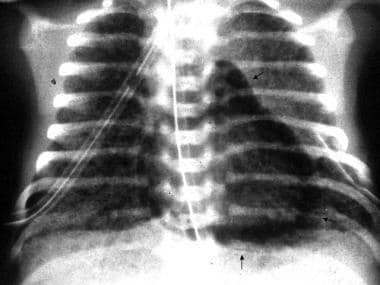 Radiograph obtained shortly after birth shows ill-defined, predominantly perihilar opacities in the lungs; these are more severe on the right than on the left. The lungs are hyperexpanded. The neonate's heart size is within normal limits. 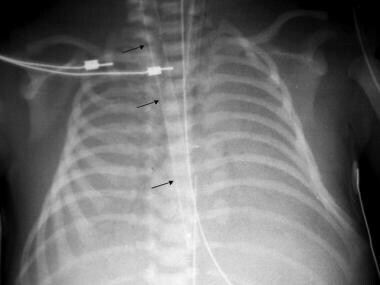 The abnormalities on the initial chest radiograph, aside from the presence of an endotracheal tube and an umbilical artery catheter, are identical to those seen in severe cases of transient tachypnea of the newborn. Meconium aspiration. Radiograph obtained 2 days after that of the previous image shows almost complete resolution of the pulmonary opacities. Meconium aspiration. Radiographic abnormalities in a patient with meconium aspiration who was treated with extracorporeal membrane oxygenation (ECMO). The lungs are airless because of pulmonary bypass. A cannula (arrows) enters from the right neck and extends to the right atrium, providing venous-venous ECMO. An endotracheal tube, a nasogastric tube, and an umbilical artery catheter are also in place. Chest radiography is the preferred examination. [2, 3, 4, 5] However, the inflammatory process of meconium aspiration may have various presentations on chest radiography, and it is initially indistinguishable from transient tachypnea of the newborn or neonatal pneumonia. Without visualization of meconium below the vocal cords during resuscitation, the diagnosis is made on the basis of the clinical course and the results of follow-up imaging studies. 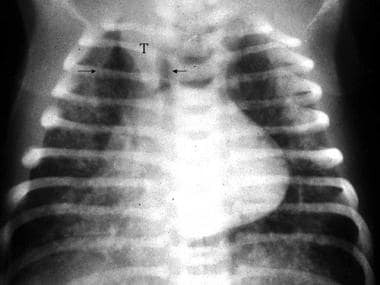 Transient tachypnea of the newborn usually demonstrates patchy opacities on radiographs caused by pulmonary fluid in the process of resorption. 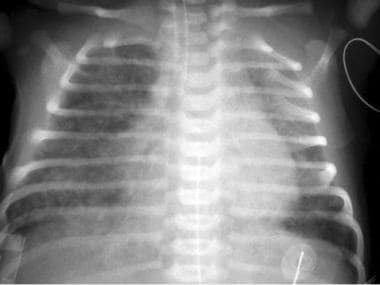 Follow-up radiographs show rapid clearing of infiltrates, in contrast with meconium aspiration syndrome or pneumonia. Neonatal pneumonia usually has patchy opacities representing consolidation, with pleural effusion present in up to two thirds of cases. Lung volumes are usually normal, but the lung fields may be hyperinflated. Respiratory distress syndrome usually has a uniform distribution of opacities, classically with a ground-glass appearance and decreased lung volumes due to alveolar collapse. Air bronchograms may be seen. Pleural effusions are rare. This is most often seen in preterm infants (in contrast to those with meconium aspiration syndrome). In addition to persistent pulmonary hypertension of the newborn (PPHN), other issues of neonates should be considered, including sepsis, pulmonary hypoplasia, congenital anatomic pulmonary anomalies, congenital diaphragmatic hernia, and congenital heart disease. PPHN can be confirmed with echocardiography. Also, keep in mind that some cases of meconium aspiration syndrome result in litigation when parents discover that their infant requires long-term care due to sequelae of prolonged perinatal hypoxia. For excellent patient education resources, visit eMedicineHealth's Lung Disease and Respiratory Health Center. Also, see eMedicineHealth's patient education article Acute Respiratory Distress Syndrome. 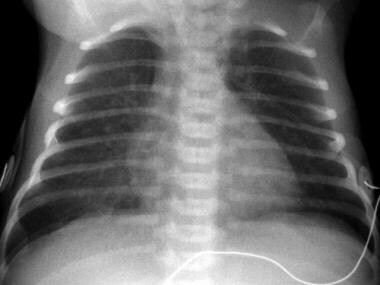 Chest radiography typically shows hyperinflation with patchy opacities. These findings represent areas of atelectasis mixed with areas of air trapping. Air leaks are common, leading to pneumothorax, pneumomediastinum, pneumopericardium, and/or pulmonary interstitial emphysema. Pleural effusions may be present. Note that it is important to assess the positioning of tubes (endotracheal, nasogastric), lines (umbilical arterial/venous catheters, peripherally inserted central catheters), and other devices. See the following images. Meconium aspiration. Radiographic findings in a more severe case of meconium aspiration. This initial radiograph obtained shortly after birth shows patchy, coarse parenchymal opacities and severe hyperexpansion. In addition, pneumomediastinum is present on the right (arrows), outlining the right lobe of the thymus (T). Meconium aspiration. Follow-up radiograph of the patient in the previous image. This image was obtained after placement of bilateral thoracostomy tubes for pneumothoraces and shows pneumopericardium (arrows) and extensive imaging lucencies in the lungs. These findings indicate pulmonary interstitial emphysema. This disease is primarily a clinical diagnosis, and patients should be treated on the basis of their clinical presentation. In isolation, chest radiographs are neither sensitive nor specific for the diagnosis of meconium aspiration syndrome. If neurologic damage is suspected, neuroimaging modalities such as computed tomography (CT) scanning, magnetic resonance imaging (MRI), and ultrasonography  may be considered. An echocardiogram is needed in severe cases of meconium aspiration syndrome with prolonged respiratory distress to evaluate cardiac function in the setting of potential PPHN and congenital cardiovascular problems. Fischer C, Rybakowski C, Ferdynus C, Sagot P, Gouyon JB. A Population-Based Study of Meconium Aspiration Syndrome in Neonates Born between 37 and 43 Weeks of Gestation. Int J Pediatr. 2012. 2012:321545. [Medline]. Donnelly LF. Meconium aspiration syndrome, extracorporeal membrane oxygenation. Fundamentals of Pediatric Radiology. Philadelphia, Pa: WB Sanders; 2001. 23-4, 28. Williamson SL. Meconium aspiration syndrome (MAS). Primary Pediatric Radiology. Philadelphia, Pa: WB Saunders; 2002. 19-20. D'Alessandro MP. Meconium aspiration syndrome. Virtual Children's Hospital. Paediapaedia: neonatal chest diseases. Accessed: 2004. Morabito CJ, DiCarlo JV. Meconium aspiration syndrome. All-Net: neonatal respiratory failure. Accessed: 2004. Piastra M, Yousef N, Brat R, Manzoni P, Mokhtari M, De Luca D. Lung ultrasound findings in meconium aspiration syndrome. Early Hum Dev. 2014 Sep. 90 Suppl 2:S41-3. [Medline].